A Foolish Take on Investing, Falling Housing Prices The Motley Fool's Tom Gardner answers listener questions on investment strategies, tactics, and what to buy or sell. The Motley Fool's Tom Gardner answers listener questions on investment strategies, tactics, and what to buy or sell. And right now our regular visit with the Motley Fool. Newspapers themselves are in the news this week. Circulation at 22 of the top 25 papers is down, continuing a two-year trend. Publishers blame the Web and talk about doing more business online. Investors just want better news. Jeff Skilling, the former CEO of Enron, now a convicted felon, was sentenced to 24 years in prison for his role in the collapse of that company. And in another sign that investors need to keep an eye on the executive offices, several big name companies admitted they'd been fudging the numbers by backdating stock options. And retail is hot again. Christmas has investors seeking stockings of cash. And the rush is on to buy into the right shops, the right clothes, and the right toymakers. Hey, but whatever happened to buy low and sell high? To help us sort through all this financial news we've called on Tom Gardner, cofounder of the Motley Fool, a multi-media company that's devoted to helping people sort through investment decisions. He joins us now as part of our monthly conversations about money and investments. If you have questions about investment trends, hot or cold in economic sectors or the overall conditions of the market, give us a call: 800-989-8255, 800-989-TALK. E-mail is talk@npr.org. First our usual caveat, neither Tom nor I will offer any advice on whether to buy or sell this particular stock or sell that one. But if you have questions about the way things work, about trends or philosophies of investment, give us a call. Tom Gardner with us now from the offices of the Motley Fool in Alexandria, Virginia. Nice to have you back on the program, Tom. Mr. TOM GARDNER (Motley Fool): Good afternoon, Neal. We have a lot to talk about. CONAN: We do. And let's start with those latest newspaper circulation numbers. If you own stock in a newspaper company, how worried should you be? Mr. GARDNER: You should be pretty worried. This is unprecedented for newspapers to have had such consistent declines in circulation as they have over the last couple of years. And this last one - last report shows again continuing problems. And it - obviously it signifies that advertisers are looking closely at those numbers and are leaving for the Web as well. So it's not just that audiences are finding more attractive options for getting information and staying in touch with what's happening in the world. It's also that the business that surrounds that, particularly when it comes to classified advertising and national advertising for newspapers, is shrinking. And that really hurts those companies. CONAN: Yet it seems that a lot of the time the profits reported by newspaper companies are often pretty good, and needless to say, sometimes the profits reported by online companies are, well, we're going to be making profits sometime in the future and the sweet by and by. Mr. GARDNER: And the market looks forward at that, Neal, and of course in some cases the market makes a big mistake, as it did in 1999. I'm reminded of something one of my favorite investors in the world - Marty Whitman of the Third Avenue Funds - said. He said, there's truth in every bubble. And there's a little kernel of truth there that you have to learn from. And we all looked at the Internet bubble in the late '90s and said, gosh, we were insane. Things got out of control, and these companies really had no earnings. But the truth in that bubble was that of course user data was demonstrating, even when these stocks were down 50 to 90 percent, the popularity of using the Internet was continuing at a very fast pace. And so you're starting to find companies that are generating quite a bit of profit online now. And what the market's looking at is, what is a reasonable expectation of growth for these two different categories, newspaper and online? And in the world of newspapers right now, the answer is very little growth. And the problem really is this is not a temporary issue. This is not, you know, high oil prices so we aren't shopping as much. This is a departure of customers to go somewhere else and to another place that they will not return from. CONAN: Let's get listeners involved. And of course, this is for you guys. James is with us. James calling from Clarkdale in Arizona. JAMES (Caller): Yeah, I've got a quick question. I have a 401 and I have Roth and I have a 457 and I buy stocks separately. Right now the law says that I can - when I leave my employment I can take the 457 and start pulling on it. I'm concerned is - the reason I buy stocks in the 457 is that when I do decide to retire at 50, I've got diversity. Is the law going to change, or could it change to where the 457 would not help me from 50 to 65, and should I put more money into my 457? Or should I try and stay even more diversified? Because if the law changes, I could get hit right in the middle of where I'm trying to set up for my retirement. Mr. GARDNER: Well, in general, I favor making sure that you've got diversification. If you've got concerns about a particular investment product or a vehicle getting sunsetted or altered significantly, you need to talk to a financial advisor. You can also come onto our site at fool.com and get opinions of people who know more about the 457 than I do. But in general, I think you're right to be thinking and asking questions about it. And I am a fan of diversification and of making sure that you've got the different bases covered as you head into retirement. Unfortunately, I don't know enough about the 457 plan to specifically answer your question. CONAN: Here's an e-mail from James Bullock(ph). I am low income but live modestly and make ends meet. I only have a small car loan and student loan as debt, but struggle to save. It seems every time I get some money together, something comes up - new tires, a trip to the doctor - and as I'm uninsured, that brings my balance back to zero. I work hard but just don't make much money. In my world, there is no balance back to - there is no 401K, no stock option, no IRA. What can I do for my retirement? It looks like I'll have to work until I die. I know that there are others out there like me. What advice do you have? Mr. GARDNER: The advice that I have is to prepare to work longer. Now I'm not sure how far through your retirement you'll be - how long you'll have to delay a full retirement, but you know, I'm of the opinion that a full retirement is overrated. Of course, I'm saying this at the age of 38, but our grandfather - our maternal grandfather - worked right up until he was 95 years old, and he passed away three years later. He demonstrated for us that if you love what you're doing and you can tilt your time toward things that you love to do, you can stay in the game of generating income for a long time. Now you may not be working right now in a job that you particularly love. I don't know, that wasn't part of the question. But it is out of the writings of Peter Drucker that I have really focused my career. And when I've counseled people here at our company, at the Motley Fool, to evaluate on a once-a-month basis: am I really doing what I love? Because even if you have a great job, you may be asked to do a variety of things within that company over time that pull you in different directions. I think if you learn to reset once a month and ask yourself what am I really good at doing, and what do I really enjoy, and am I able to spend my time at that? I think you're going to find that working up until age 62 and then throwing your fists in the air and saying, yes, I never have to work again is not really the model of the future. And I encourage you to keep attempting to save. If there are opportunities to take a second job and generate some savings out of that - I understand the reality that you're in, though, and I think that you've got the discipline in place, and you're just waiting for the right opportunities to come along and put that savings away. CONAN: Let's go to Glenn now, Glenn with us from Palo Alto, California. CONAN: Oh, on women's purchasing power, yes. GLENN: Yes. I was wondering what role women play in financial investment decisions. I know there's been a lot of research showing that women tend to make safer, more conservative and often-times better decisions in financial investments, and I was wondering whether women's increasing role in making purchasing decisions was also carrying over to financial investments. CONAN: Hmm. What do you think, Tom? Mr. GARDNER: Well, since we're three guys here, let's stroke our egos and say we're doing a great job, and let's just leave it at that. CONAN: And that women shouldn't worry their pretty little heads. Mr. GARDNER: Unfortunately for us, the reality is that women have demonstrated time and time again - year in, year out - that they trade less. When it comes to investing, there are a couple factors that really determine the long-term success of an investor. Interestingly, Warren Buffett has said, it wasn't that I was able to read financial statements or that I got to talk to CEOs. The reason that I succeeded was because I learned how to manage my temperament. I came to understand how to discipline my emotions. Most guys, or a lot of guys, that are out on the stock market today are trading a lot. They're finding tips, they think activity means success. And on average, women are much more patient with their investments. They're making investments in companies, and they're holding them for long periods of time. Now having said that, most of the participation in the stock market today is male. And that means that there's a lot of trading, a lot of commissions for Wall Street, which makes those firms happy. But the better returns - and this has turned up in one academic study after another - women are generating the better investment returns because they're buying to own rather than trading paper stubs back and forth and hoping that they get a good quarter point or a gain of seven-eights on the stock that they bought last week. CONAN: Glenn, thanks for the call. CONAN: Here's another e-mail, this from Jane Stoner. My husband and I have an empty nest, and for the first time in 30 years have too much money. We're upper-middle income. Our taxes are killing us. We still have eight years or so to go to retirement, but our portfolio is solid. So we're contemplating buying a second home or condo to enjoy in a few years, but also as an investment to help keep the IRS at bay. With retirement so near, is it a bad idea to take on a mortgage? Are there other options out there for folks like us? Mr. GARDNER: Well, I mean, there's the option of time-shares, which is becoming an industry that is above board. There were a lot of questionable time-share sales 10 years ago, but it's become a much cleaner industry today. So a time-share is an option for you. I've also thought and counseled a number of people that are heading into retirement that come to our site that they should think about shrinking their own core house down. Their primary residence should be smaller. We, over the last 40 years, have ended up with a tremendous amount of space in our homes and smaller families than we had four decades ago. So do you really need all the space that you're living in in your core residence would be the first question I'd have that couple answer. And then, sure, I like the idea of getting a second home. You have to evaluate your financial situation. And, of course, we're unlikely to see anything like the returns from an investing standpoint in real estate over the next 10 years that we saw over the last 10 years. But as long as you're aware of your - keeping in the bounds of your overall financial plan and really evaluating whether you need all that house you're living in today, I think sure, you should be looking to really enjoy the second half of your life. CONAN: We're speaking with Tom Gardner, co-founder of The Motley Fool. We do that once a month, and you're listening to TALK OF THE NATION from NPR News. And let's go to Jim, and Jim's with us from Jackson, Michigan. JIM: I wanted to ask Tom a question about what he thought the stock market would do if the House and the Senate do change hands from Republican to Democrat. CONAN: And, of course, the election's on Tuesday. Tom? Mr. GARDNER: You want me to make a political statement? CONAN: No, he said if, if. Mr. GARDNER: Yes, yes. No, I know. I'm kidding. CONAN: That unfortunate bubble-bursting thing, yes. JIM: Right. But I was interested because some people are saying - or I'm hearing some things about they think there'll be a sell-off if the Democrats take over, but then long-term, they may recover and even do better than it is now. Mr. GARDNER: Well I think first of all, I would just look in the overall context of what the stock market has done recently. We're up about 14 percent just since mid-summer, so that's a pretty extraordinary return over a short period of time. You have to factor that into the context of the market gaining about 10 percent a year on average over the last century. So we've have 14 percent just a couple months. So the market may be flat or down, and it could have no relevance - the political election could have no relevance to what the market does in that respect. I mean, I happen to believe that if you look at the financial costs of the War in Iraq, any further inquiry and investigation into how to manage those costs and any possible change in our approach in Iraq - which would necessarily have to emerge out of some change in at least the House, and/or the Senate - that could cause the market to rally, because it's quite expensive. The War in Iraq today is about $2 billion a week, whereas the Persian Gulf War 15 years ago was $8 billion for the U.S. overall. We had 34 coalition countries that paid 87 percent of the cost of that war, and it was an $8 billion cost to us. Now it's costing $2 billion a week. So a possible change in the approach in Iraq and, therefore, potentially a reduction in the cost - or the projected long-term cost - could cause the market to rally. But I guess I'll close that by saying there are so many factors involved in what makes the stock market go up from any day, week or month, even a year, that you find the people that try and predict where the stock market is going the next 12 months or less are consistently inaccurate. I mean, they may be right once or twice and get to put out a newsletter or go on TV and say they were right, but if we were to track all their picks over the last 10 years, it's a game not worth playing. It's better to just find great companies, methodically invest in them each month and be a long-term owner, as we were saying, as women, on average, have been investing in the U.S. market. CONAN: Speaking about another seasonal subject, one area that's done well lately is retail, and with the holidays coming up, is it time to check out companies in that sector? Mr. GARDNER: Well, you know, when we talked earlier about newspapers, Neal, and I mentioned that that didn't seem like a temporary problem to me, that circulation is down and that if you're under the age of 35, you're increasingly unlikely to subscribe to a newspaper. The same is not the case in an industry like retail. The retail stocks were really beaten down this summer, and that was in part tied to high oil prices. But we can all see that as a pretty temporary issue. It's not a question of people deciding to not shop anymore. They're going to continue going to the store when they have disposable income and oil prices come down. And so since July, the returns for retail stock investors have been incredible. I mean, Abercrombie & Fitch is up 45 percent. J Crew's up 25 percent. American Eagle Outfitters is up 40 percent. Bebe store is up 60 percent. Those are just a couple-month returns. And that's really a reminder to anyone who's a listener who's thinking about investing in stocks or is an investor in stocks, and just a reminder that the stock market is an auction market. And that means it's best to be bidding where no one else is bidding, or where people are disgusted an no longer want to own those stocks. So many of the retail stocks were down 25 and 30 percent over the last year come into the summer, and you see these great returns since then. So if you can train yourself to see tough times for a particular industry as a great investment opportunity, you're opening up the possibility of superior returns. Now I happen to think some of these retail stocks are still attractive for long-term investors, but I guess the primary point I'd make about retail stocks right now is you want to go in and find that industry when it's deeply out of favor and then start adding. And there are some industries that are deeply out of favor now, like homebuilders, that I think are attractive. If we look at the demographics, we have 300 million Americans today. And in 40 years, we're projected to have 420 million Americans, so 40 percent growth. That means there are going to be a lot more homes, and home prices are going to be a lot higher in desirable urban areas. And that to me is a temporary nick on an industry that is pretty attractive for long-term investors today. CONAN: We have 30 seconds left for you, Tom. The Dow crossed new highs, passed that 12,000 mark. Is that significant at all? Mr. GARDNER: Not really. I mean, I think those make for some fun media stories - Dow 10,000, Dow 11,000 - but the fact of the matter is we should be looking at percentage gains. And when we're at Dow 24,000 and it goes to 25,000, you know, it's less than a 5 percent gain. So it's just - it becomes less material as we hit each one of those numbers going higher. CONAN: Tom Gardner, thanks as always. Mr. GARDNER: Thank you, Neal. CONAN: Tom Gardner, co-founder of The Motley Fool. You can find a link to his Web site at the TALK OF THE NATION page at npr.org. He joined us from Fool Global Headquarters in Alexandria, Virginia. Joe Palca's here tomorrow with Science Friday. We'll see you Monday. This is TALK OF THE NATION from NPR News, I'm Neal Conan in Washington. The latest figures from the National Association of Realtors show that nationwide, the median sale price -- half of all homes sold for more, half for less -- of an existing single-family home fell 2.5 percent in September from the same time last year. The drop was more pronounced in the Northeast, where prices were down 5.1 percent, and the West, where they fell 4.3 percent. The latest real-estate data leaves no room for doubt: The housing market is in the midst of a substantial correction. The Commerce Department reported Thursday that the median price for a new home fell 9.7 percent from the same time last year. That’s the biggest drop since 1970. Existing home sales fell 2.5 percent. Of course, prices and sales have been falling for some time now. And that's starting to tempt some bargain hunters. Whether it's a good time to buy a house depends a lot on where you live. Economists say many cities haven't seen much of a correction yet; they predict that prices will keep sliding in some of them for years. But other areas could level off much sooner, in part because prices are already down. In Arlington, Mass., a suburb just outside Boston, home prices have fallen 18 percent from their peak in the summer of 2005. Back then, 38-year-old art teacher Alan Sutherland was visiting open houses, but found everything to be unaffordable. "We actually looked at a condo in Arlington in the mid-400s … and as they were selling, they were going up. So we gave up and just put it off," Sutherland recalls. But in the past couple of months, Sutherland says friends have been calling to tell him about not just condos, but single-family homes they've seen in the area for sale in the mid-$300,000 range. He says he never saw that last year. Don't Jump In. But Do Look. Broker Anita Shishmanian is working with Sutherland on his house hunt. She says that in recent weeks, her phone has been ringing more, as buyers get interested in looking for deals. "Buyers are suddenly just deciding, 'Oh, maybe it's time to buy,'" Shishmanian says. "They're always hearing now that it's a buyers market." And it's not just brokers saying that. So is Mark Zandi, chief economist at Moody's Economy.com. "I'm not saying jump in right away," Zandi says. "There's no need to. I think, though, it's a good time to start looking around. There's a lot of inventory, a lot of options. Inventories have never been as high as they are today. 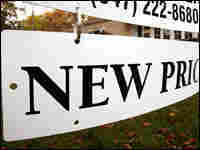 Moreover, fixed-mortgage rates are down a little bit, and sellers are willing to deal." Zandi recently came out with a report, "Housing at the Tipping Point," that projects the severity and length of the housing correction in nearly 400 cities and towns across the country. The variation is dramatic. He says some markets will see modest price declines and may be at the bottom of their trough already: Boston, Napa, Calif., Salt Lake City, Boulder, Colo. He says you might find a good deal on a house there right now. But in other areas, Zandi says prices will keep going down: Reno, Washington, D.C., Vallejo Calif., and Naples, Fla., among them. And some economists still see a strong case for renting. "Economic fundamentals favor renting at the moment," says Gleb Nechayev, with Torto Wheaton Research in Boston. "No question about it. In most major cities, renting seems like a better deal because of how much house prices have gone up." Nechayev says that even with housing prices starting to come down, the monthly cost of owning is still historically very high compared with renting. And he says almost nobody expects home prices to rise for a few years. So he argues it doesn't make sense if you're spending, say, $1,400 a month to rent a two-bedroom apartment to pay a $2,200 mortgage on a similar two-bedroom condo. True, there can be tax savings when you own. But there are also added costs: insurance, condo fees, maintenance and repairs and property taxes. That said, if you find a house you just love and want to be in for a long time, many economists say it's not a bad time to buy in some cities -- if you do your homework.